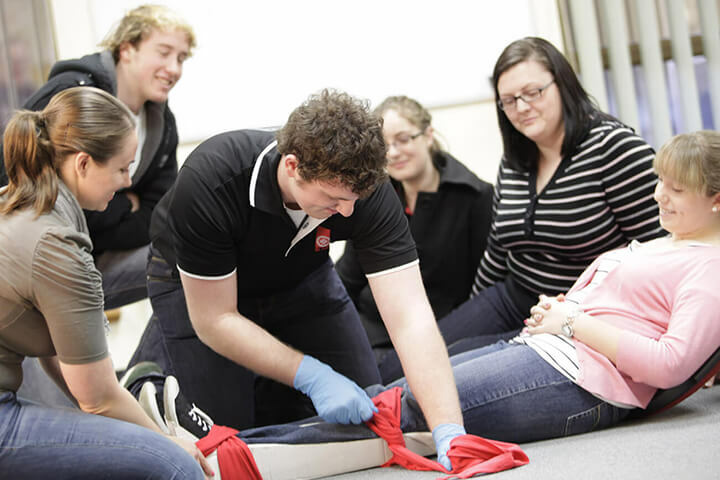 Develop skills and knowledge around a broad range of first aid topics. Provide First Aid 2-Day Course is recommended for those: nominated/appointed by industry as First Aid Officers; who have previously completed a First Aid program and need to confirm their competence and this level; who may come across accidents/incidents; wishing to acquire first aid skills for employment purposes, or are interested promoting health and well being in their community. Provide Basic Emergency Life Support course will provide you with the basic skills and knowledge to respond to an emergency situation at home, work and anywhere in between. You will learn to provide life support and the management of a casualty of any age until the arrival of medical assistance. The St John Cardiopulmonary Resuscitation (CPR) course gives you the skills to perform CPR on a person who is unconscious and not breathing normally. You will require the knowledge and confidence to perform CPR on an adult, child and infant, to describe alternative methods for delivering rescue breaths and how to manage a victim of drowning. This course is appropriate for people who work in high risk areas, act as first aiders to larger facilities or groups, or work in areas where help may be delayed or have difficulty accessing casualties. The course covers a broad range of advanced skills and provides you with high level skills in management of large incidents, major trauma, sudden cardiac arrest, emotionally disturbed and drug affected casualties. Do you work with heavy machinery or in a high-risk work environment? A higher first aid qualification may be required to ensure your staff and employees are protected against potential dangers. This course equips students for emergencies in a high-risk work environment and provides the skills necessary to be responsible for a first aid room. This course is designed to equip parent and grandparents with the knowledge to manage basic first aid situations specific to children up to the age of 7. On successful completion of this course you will be issued with a St John Ambulance statement of attendance. This is a non accredited training course. There are no entry requirements or prerequisites to undertake this training. This course covers the proper administration of paracetamol and methoxyflurane to relieve pain. It includes information about the use, storage and documentation of administration as well as ongoing monitoring of the casualty. This course provides participants with the skills to manage the danger of accidental electrocution. It is primarily designed for electricians. This course is designed to give you the confidence, knowledge and skills to recognise and manage an anaphylactic emergency including the use of the adrenaline auto-injector. This course applies to a wide range of settings where emergencies involving allergic reaction may occur. This course gives you the skills to perform risk assessments and determine your first aid needs in line with workplace health and safety legislations, and the first aid codes of practice. It also teaches you how to design and run first aid facilities (such as sick rooms) and implement and monitor incident responses in your workplace. Provide First Aid 1-Day Course is recommended for those: nominated/appointed by industry as First Aid Officers; who have previously completed a First Aid program and need to confirm their competence and this level; who may come across accidents/incidents; wishing to acquire first aid skills for employment purposes, or are interested promoting health and well-being in their community. This course is specifically designed to meet the needs of educators and support staff working within an education and care setting, who are required to respond to a first aid emergency including asthmatic and anaphylactic emergencies. This course is a nationally recognised unit that describes the skills and knowledge required to provide a first aid response to infants, children and adults. It covers child-specific first aid in many high-risk areas such as anaphylaxis and asthma, as well as common injuries and resuscitation. Course for those who are required to provide an emergency first aid response in a workplace. The course gives you the confidence, knowledge and skills to recognise and manage an asthmatic emergency including the use of the asthma inhaler. The St John Advanced Resuscitation course is a course designed for experienced first aiders who use specific equipment and often work in higher risk environments. This course develops advanced skills for providing life support and focuses on the use of oxygen delivery systems and in-depth knowledge and skill in the use of Automated External Defibrillators (AED). This remote area first aid course is specifically designed to meet the first aid needs of bushwalkers, wilderness guides, and people who work or live in remote locations. The course covers everything from comprehensive first aid treatments to aeromedical evacuation, long-term care, self-care and contingency planning. This course is focused on the safety of the first aider and extended care of an ill or injured casualty where help is likely to be delayed or inaccessible. St John Ambulance believes in empowering our children and youth to be capable in first aid situations. Junior First Aid is a course designed specifically for 8 to 13 year olds to build their confidence and skills in dealing with first aid situations. On successful completion of this course you will be issued with a St John Ambulance statement of attendance. This is a non accredited training course. This course is designed to give you the confidence, knowledge and skills to recognise and manage asthmatic and anaphylactic emergencies including the use of the asthma inhaler and the adrenaline auto-injector. A successful outcome for this statement of attainment will be determined by a range of different assessment methods including written assessment, observation of simulated and practical activities etc. With mental health issues becoming more and more common, first aiders at work and at home are now being called to help with conditions related to the mind. Our courses are delivered by experienced professionals who give you strong skills to recognise the signs of mental disorders early, effective strategies to assist, and the confidence to use them. Manage common first aid situations that can arise in an electrical services industry environment. This course provides participants with the skills to manage common first aid situations that can arise in an electrical services industry environment, including rescue from low voltage panels. In order to comply with Standard 1.8 of the Australian Skills Quality Authority (ASQA) Standards for the Continuing Registration of a Registered Training Organisation (RTO), it is necessary to confirm the identification of all participants in accredited training to ensure that the person providing assessment evidence (the learner), is the person who is enrolled and is subsequently issued the Statement of Attainment/Qualification. Evidence that this process is in place must be available. Do you need your Unique Student Identifier? The USI is a Federal Government initiative linking all of an individual's training undertaken in the Vocational Education and Training sector. Without a USI number, students will not receive documented recognition for the VET sector training they complete. Click here for further USI information.